More than 200 jobs are to be created at an Isle of Wight wind turbine factory. MHI Vestas Offshore Wind is to start producing the 80m (260ft) blades for a windfarm in Liverpool Bay. Chief executive Jens Tommerup said: "These new jobs are skilled and form a critical aspect of our manufacturing capability". Production of the blades is due to start in May at the company's research and development plant at West Medina Mills, near Newport. Vestas said the blades would be meeting demand for DONG Energy's 258 MW Burbo Bank Extension project in Liverpool Bay, as well as potential future offshore projects. When the company closed its turbine production plant in Newport in 2009, leading to the 18-day sit-in, it blamed a lack of demand for wind turbines in the UK. 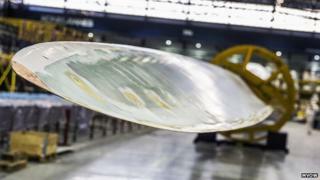 But the company opened a research and development facility in 2011, where the new blades have been designed and tested.